It was always Jessica’s dream to move to Mexico. Immediately after obtaining a degree in Commercial Recreation, Leisure & Tourism and completing her internship at the Mexico Tourism Board in Chicago, she moved to Puerto Vallarta to start working for Journey Mexico. Jessica is originally from Michigan. Growing up, she spent several weeks a year vacationing in Mexico’s beach destinations and always found herself drawn to Mexican culture. After spending a summer studying in Puebla and experiencing the in-land parts of the country she knew Mexico was where she belonged permanently. It was that summer when she decided she would dedicate herself and her career to promoting Mexico’s rich, authentic culture and educating others on the diverse tourism offerings. 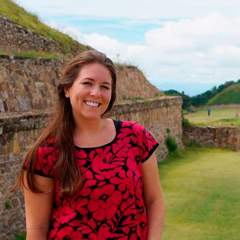 Working for Journey Mexico has given her the opportunity to share her passion in a unique way. She is excited to learn everything she can in the industry and about Mexico in hopes she can inspire others to explore the beautiful country.